Want to Bounce, AND slide, but also have the option of having a Water slide? 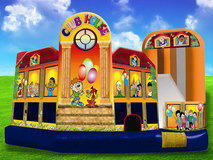 Well, you get all that in one with this clubhouse combo bouncer. Kids can jump, play basketball, go over the obstacles, up the climbing wall to the slide, and with this slide, you can attach the water hose to it, for a sprinkling effect to use it as a water slide! So not only is this a 5 n 1, it becomes a 7 n 1! On a hot day, combine this with a sno kone machine and make it a package deal! 16 Ft Double Dry Slide . 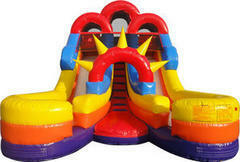 This slide's beautiful bright colors and design is a guaranteed attention grabber & definitely guarantees hours of fun! Participants climb up the stairs in the middle and choose a slide to the right or to the left, and race down, meeting up at the bottom! Who will make it to the bottom first? Separate exits at the bottom make it an easy and safe experience for everybody!! Great for Backyard parties, or Large Events! 16 Ft Double Lane Water Slide. Need to cool off?? Well come beat the heat with this Double Lane Water Slide. 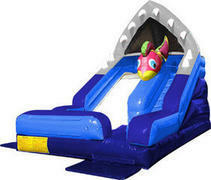 This slide's beautiful bright colors and design is a guaranteed attention grabber & definitely guarantees hours of fun! Participants climb up the stairs in the middle and chooses a slide to the right or to the left. Then makes a dash and splash all the way down! Meeting up at the bottom! Who will make it to the bottom first? Separate exits at the bottom make it an easy and safe experience for everybody!! Great for Backyard parties, or Large Events & definitely a great way to "cool" your guests off on a scorching hot day!! Shark ATTACK 15 ft DRY Slide! The Great Shark ATTACK! THis slide is perfect for thrill seekers who have always wanted to face a Great White shark! This adorable slide has a right-sided climb, taking riders up past a friendly escaping fish and past the three-dimensional jaws of the Great White shark. Players then pass under the big inflatable "teeth" of the shark and speed down to clearer waters in the puddle splash, with a cushioned bumper for extra safety. A great way to cool off in the summer months, or for a themed event, this dry slide will please participants, young and old!! We Dare you to come face to face with the Great White Shark in this Shark ATTACK!!! The Great Shark ATTACK! This water slide is perfect for thrill seekers who have always wanted to face a Great White shark! This adorable slide has a right-sided climb, taking riders up past a friendly escaping fish and past the three-dimensional jaws of the Great White shark. Players then pass under the big inflatable "teeth" of the shark and speed down to clearer waters in the puddle splash, with a cushioned bumper for extra safety. A great way to cool off in the summer months, or for a themed event, this slide will please beach lovers young and old. We dare you to come face to face with the great white shark in this Shark ATTACK!! The Tropical 2 Lane Slide is a feast for the eyes. You won't find a more beautiful Run 'N' Splash anywhere. This unit is 35' feet of watery fun. Riders scream down their own separate lanes until landing in the attached 9' long pool.